Paraffin wax use in coatings: It is added to many candy coatings and chocolates to give the treats a shiny finish. It is also used to coat fruits and vegetables to extend shelf life by retaining moisture. Paraffin wax use in candles: Paraffin wax is popularly used in candle making process. Paraffin candles are odorless and bluish-white in color, burns more cleanly and are also more economical than other types of candles. Almost all types of candle can be made with paraffin wax. The melting point is the primary determinant of the type of candle you can make with it. High melt point wax (greater than 150F) is used for more special applications like hurricane candle shells, over-dipping, and other special candle making applications. Paraffin wax use in cosmetics: Cosmetically, paraffin wax is often applied to the hands and feet. The wax is a natural emollient, helping make skin supple and soft. When applied to the skin, it adds moisture and continues to boost the moisture levels of the skin after the treatment is complete. It can also help open pores and remove dead skin cells. That may help make the skin look fresher and feel smoother. It acts like a form of heat therapy and can help increase blood flow, relax muscles, and decrease joint stiffness. Paraffin wax can also minimize muscle spasms and inflammation as well as treat sprains. Paraffin wax uses in crayons: It is the primary ingredient in crayons that gives them their waxy texture. The wax, mixed with color pigments, is poured into a mold to form the crayon. 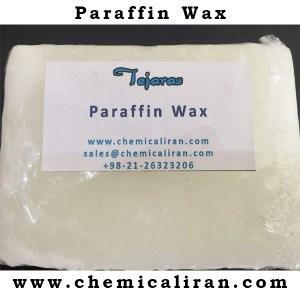 Paraffin wax use in matches: Paraffin is naturally water resistant. Paraffin wax coatings can be applied to a variety of products to make them waterproof, including matches, wood and bottles. To make your own waterproof matches, dip the match head in melted paraffin wax, remove it from the wax and blow on it to cool and harden the wax quickly. Paraffin wax use in rubber: In order to prevent rubber from being cracked with air or sun light, it is formerly known that a wax-based antioxidant is used in rubber. When the wax-based antioxidant is blended with rubber, the antioxidant oozes out onto the surface of rubber and forms a thin film thereon. This thin film prevents the rubber from contacting ozone, and thus prevents degradation thereof. Paraffin wax uses as friction reducer: Since paraffin wax has lubricating properties, it is applied to a variety of products to reduce friction. Snowboarders, skateboarders and surfers apply paraffin wax to the bottom of their boards to help them glide easier. Paraffin wax uses as moisturizer : A number of toiletries and cosmetic products contain paraffin wax as a moisturizing agent. As paraffin wax is potentially comedogenic and may lead to acne or pimples, such moisturizers are usually recommended for those with very dry skin. Paraffin wax use in paint: Among the plethora of additives available today, waxes have a significant impact on many formulations or processes. Even if used in relatively small quantities – typically below 3% solids content of the total composition – waxes impart or improve effects as various as slip and lubrication, abrasion resistance, anti-blocking, matting and water repellency – all critical properties in the coating and ink areas. Hence, waxes are often classified as surface conditioner additives. Wax is added to paper products to make them more durable and moisture resistant. A thin coating of wax keeps the paper product from disintegrating when it comes in contact with moisture, like grease or water. Wax is also added to paper products to keep things from sticking to it. Chewy candies are often wrapped in wax coated paper to make them easy to unwrap. There are three different ways wax is applied to paper products. Laminating: Wax is applied to printed paper and is used to bond two substrates together, such as foil to paper or paper to paper. The amount of wax added to the paper depends on what the coated paper will be used for. For example, butcher paper has a thicker wax coating on it than candy wrapper paper. For a ream of paper, which is approximately 3,000 square feet, there can be up to 30 pounds of wax on it.